QUICKPAQ's prepaid recycling box for compact lamps that include a poly liner, instructions, terms and conditions and a prepaid return shipping label. Not available in the states of Alaska, Hawaii and Puerto Rico. Holds an estimated 350 two pin, 175 four pin, 125 spiral lamps or 120 incadescents. Shipping to you & Recycling Fees Included in Price! 732-370-4100 to place your order. QUICKPAQ's prepaid recycling box for U-Bent lamps that include a poly liner, instructions, terms and conditions, and a prepaid return shipping label. Not available in the states of Alaska, Hawaii and Puerto Rico. Holds an estimated 80 T-8, 45 T-12 lamps or 65 400w HID. 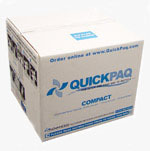 QUICKPAQ's prepaid recycling box for compact lamps that include a poly liner, instructions, terms and conditions and a prepaid return shipping label. Not available in the states of Alaska, Hawaii and Puerto Rico. Holds an estimated 64 T-8 or 30 T-12 lamps. QUICKPAQ's prepaid recycling box for compact lamps that include a poly liner, instructions, terms and conditions and a prepaid return shipping label. Not available in the states of Alaska, Hawaii and Puerto Rico. Holds an estimated 140 T-8 and 64 T-12 lamps. 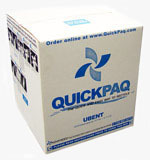 QUICKPAQ 1 gal prepaid plastic battery container with locking lid includes a prepaid return shipping label. Not available in the states of Alaska, Hawaii and Puerto Rico. Maximum weight of 15 Lbs of dry cell batteries, AAA,AA, C and D , 9 volt, and power tool sizes. 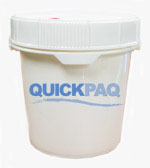 QUICKPAQ 3.5 gal prepaid plastic battery container with locking lid includes a prepaid return shipping label. Not available in the states of Alaska, Hawaii and Puerto Rico. Maximum weight of 50 Lbs of dry cell batteries, AAA,AA, C and D , 9 volt,laptop and power tool sizes. QUICKPAQ 5 gal ballast bucket holds up to 50 lbs of non PCB lamp ballast. Price includes locking lid a prepaid return shipping label. Not available in the states of Alaska, Hawaii and Puerto Rico.